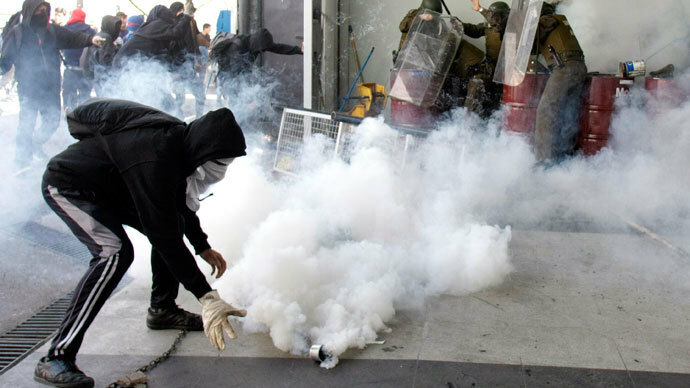 A mass protest was cut short in Santiago, Chile, after police dispersed activists with tear gas and water cannon. Over 150,000 people had gathered in the city center to urge newly-elected President Michelle Bachelet to push ahead with her reform program. Over 30 different organizations attended the “March of all Marches” in the center of the Chilean capital, calling for the Pinochet-era constitution to be replaced with new legislation that protects the rights of all citizens. 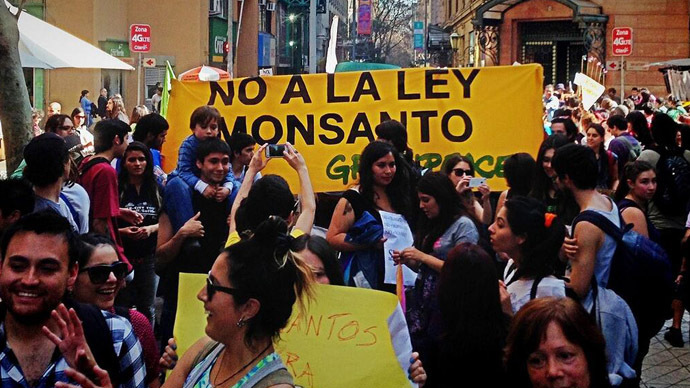 Among other things, activists demanded environmental reform, gay marriage, the legalization of abortion, the recognition of the right to self-determination of Chile’s indigenous communities, and the vote for Chileans residing abroad. For the most part, the march was peaceful, but towards the end protesters clashed with police who responded by deploying tear gas and water cannon. 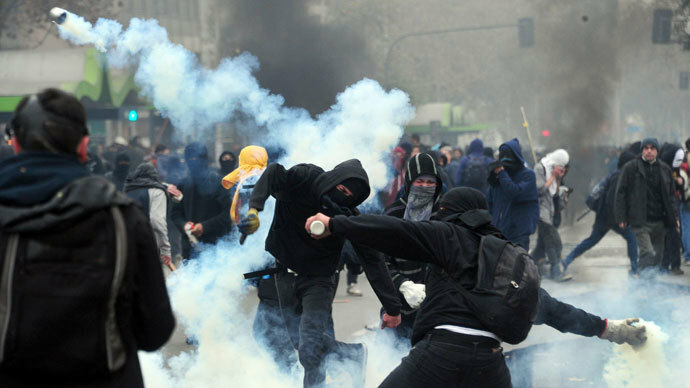 Local police reported that around 100 masked rioters scuffled with police in the center. As a result of the confrontation, 50 protesters were arrested and three police officers were injured. 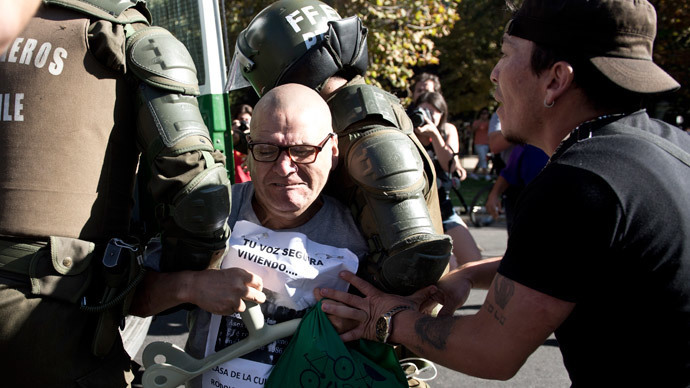 Following the incident the Chilean authorities canceled the rest of the protest, goading the event’s organizers who criticized the police for their “inability” to control a small group of troublemakers. 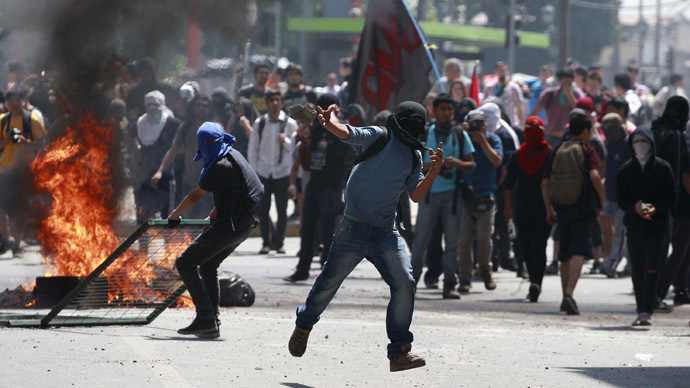 The organizers of the march stated that the event was neither for nor against newly-inaugurated President Michelle Bachelet; it was merely to let the government know about the Chilean people’s expectations. “This is not a protest against Ms Bachelet or for her, it's just an alert for the political class so they know people have demands,” said Oscar Rementeria, a spokesman for gay-rights group Movilh. Michelle Bachelet, who was previously president of Chile between 2006 and 2010, was elected in December of last year and assumed the presidency on March 12. During her presidential campaign, Bachelet pledged to make significant structural reforms, which include the implementation of a free university education and improved healthcare. Furthermore, Bachelet has said she will dispense with the political and economic bodies that were founded under the dictatorship of General Pinochet, who governed the country from 1973 to 1990. Chile’s higher education system marred the presidential term of Bachelet’s predecessor, Sebastian Pinera, who was criticized for not taking sufficient steps to reform the university system. During his term mass protests against high tuition fees became commonplace, with most ending in violence and clashes with police. While Chile remains one of Latin America’s most developed and economically-stable countries, inequality in the region is still incredibly high.